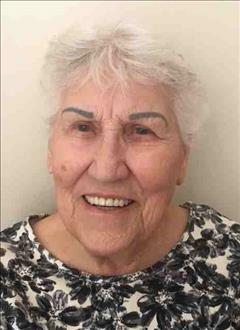 Ruby Lavern Culbertson, a resident of Glenpool and former resident of Bartlesville, passed from this life on Tuesday, August 28, 2018 in Glenpool at the age of 87. Ruby was born in Hanna, Oklahoma on April 13, 1931 to Luther Branch and Hersey Bogle Branch. Growing up, Ruby worked with her family in orchards from Oklahoma to California before returning to Oklahoma. While in California, she worked for Fairchild Corporation as an electronics assembler for approximately 15 years before returning to Oklahoma permanently. Ruby was first married to Preston "Bob" Smith and that union resulted in the birth of two sons and four daughters. Ruby was later married to James "Jim" Culbertson in Lake Tahoe and they remained happily married for approximately 35 years until Jim's death. Ruby loved her dogs immensely. She was a volunteer for Senior Citizens for approximately 13 years and thoroughly enjoyed working with senior adults. Above all, Ruby was a loving daughter, sister, wife, mother, and grandmother, and she will be missed by the many people who knew and loved her. She is preceded in death by her son, Jessie James Smith; her first husband, Preston "Bob" Smith; her second husband, Jim Culbertson; her mother and father; a sister, Mavis Winberry; and a brother, Junior Branch. Ruby is survived by her daughter, Roberta Smith and husband Stephen of Bartlesville; a daughter, Judy Smith of Glenpool; a daughter, Debby Smith of Kiefer; a son, Robert Smith of Glenpool; a daughter, Teresa Smith of Glenpool; a step-daughter, Dana Culbertson of Boise, ID; by 14 grandchildren, 26 great grandchildren, and 4 great great grandchildren; a sister, Clemmie Guynn and husband Bob of Hanna; numerous nieces and nephews, other extended family and many good friends. Viewing for Ruby will be held from 3pm until 8pm on Friday, August 31, 2018 at Integrity Funeral Service in Henryetta. Funeral services will be held at 10:00am on Saturday, September 1, 2018 at the First Apostolic Church (formerly Freewill Baptist Church) in Hanna with Rev. Clayburn Fields officiating. Interment will follow immediately at the Hanna Cemetery pavillion under the direction of Integrity Funeral Service of Henryetta. Pallbearers will be the grandsons of Ruby Culbertson.